Both: Show Media Popups now defaults to On. Both: The maximum for the texture memory slider (Preferences/Graphics/Advanced) is now set dynamically to 512MB, 1 GB or 2GB depending on the available graphics memory. The value will be at most 50% of the system’s graphics card memory. NORLV was previously fixed at 512MB maximum while RLV was previously fixed at 2GB however going much over about 2/3rd of the maximum in RLV would result in texture thrashing where textures appear to continually go in and out of focus – in fact they are continually falling out of the cache and having to be reloaded. The new code avoids this and is by Ansariel and Tonya of Firestorm. Both: If the viewer is minimised the icon no longer flashes when someone starts and stops typing an IM (or is typing a long message quite slowly with pauses) due to the distracting effect of this. As Marine notes, should there be adverse feedback about this change it will be made optional with the original behaviour as the default. Both: The script editing window now uses a larger font by default which, along with other changes, means it’s now possible to reliably position the cursor when working near the end of long lines. The font and its size can be selected in Preferences/Kokua/Scripts. Original change from Firestorm by Ansariel. Both: Clean up some formatting and layout errors in the pie menus along with ensuring that More.. is always the bottom item when it is present. Both: The Edit floater is now a little taller to resolve some overlapping that occurred on the Textures tab when Specular Shine was selected. Both on Mac: Window title code from Firestom by Tonya, Cinder Roxley et al. 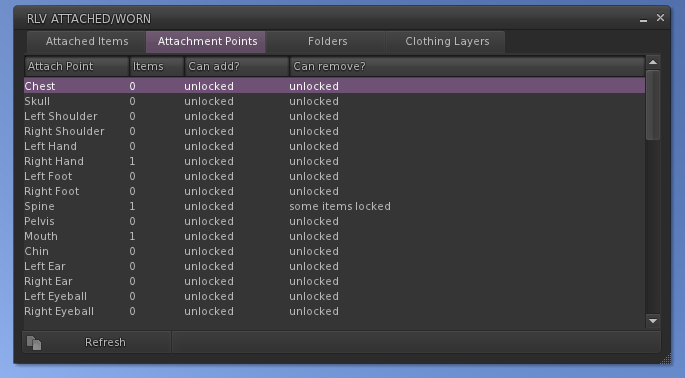 Both: Tex (Texture) Refresh was missing on the pie menu for other avatar’s attachments. Both: Bring in Exodus’ group chat mute features from Firestorm. Muting can be applied/lifted from a group’s information page. There is an optional notification in chat which is off by default and may be enabled in Preferences/Kokua/Chat. 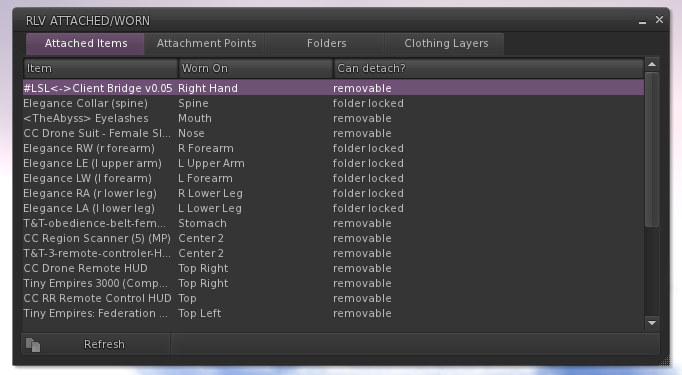 Both: Right clicking in Mouselook will now trigger a menu if enabled on the Move panel in Preferences. For those who previously used this as a way to sit on an object sitting is possible through the menu instead (or you can turn the menus off and return to the previous behaviour). 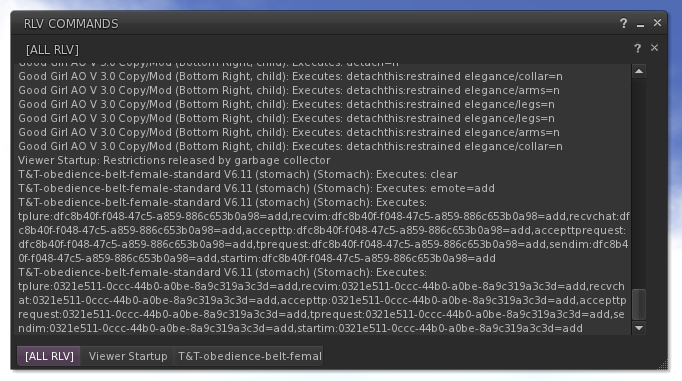 Both: Fix some more errors discovered in the XML files that define the skin and menus. Both: Avatar Health is added under the Me or Edit menus grouping together a number of features designed to help with avatar appearence issues. Some of these were already present elsewhere in the viewer menus with the remainder being newly added. Original by various authors in Firestorm. Both: After teleporting there is currently a server bug where neighbouring regions will send spurious attachment detach requests. This results in a situation where the attachment claims to be detached within the viewer but will probably reappear on the next region change and is still live (eg it is counted in the avatar’s script totals, it will respond to chat messages etc). This version brings in a fix from Henri Beauchamp in Cool Viewer which stops this happening. The fix, along with the previously added generic Firestorm protection for attachments right after a teleport can be disabled on the Kokua/Preferences/Tweaks (previously Inventory) tab. The text alongside these switches clarifies that we currently recommend this is enabled along with the other tweaks already present. Thanks to Henri for permission to include this code. The Kokua version is adapted somewhat to fit in with our existing code. Both: The log files written by Kokua on each run are currently getting cluttered with messages related to the forthcoming introduction of EEP (Environment Enhancement Project) since server code is beginning to support it but Kokua does not yet incorporate matching code. Kokua now checks for EEP-related log messages and reduces their priority and quantity to avoid an impact on performance. Both: Imported some Firestorm fixes around imposter rendering which should avoid a crash-after-teleport scenario. NORLV: The warn-once-on-RLV-command feature was actually warning more than once due to a logic error in its coding. RLV: Updated to RLV 2.9.25.4, however not all of Marine’s changes have been adopted since some have adverse effects on Kokua performance or were already present. See the detailed notes below. 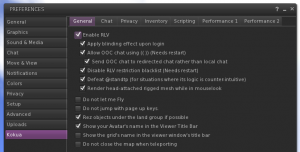 RLV: Until this version the RESTRAINEDLOVEDEBUG debug setting performed the dual purpose of enabling the ‘executes command/fails command’ feedback in the nearby conversations floater and enabling RLV-related output to the viewer’s log file. Since writing to the log file has a small but noticable performance impact this is now split into two controls with new control RESTRAINEDLOVELOGGING taking over control of the viewer log file aspects. 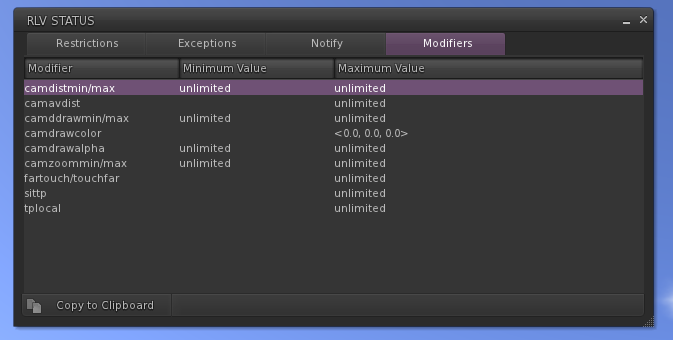 Note that this is only in Kokua, not in RLV 2.9.25.4 from Marine, although it will appear in a future version. RLV: Marine’s changes to rebake appearence after teleport and refresh attachments as apart of a rebake are NOT included in this version since we found in testing that they interfered with Kokua’s other code improvements around teleports and outfit management. RLV: Marine’s change returning the Maximum Attachment Request Lifetime to 30 seconds is already present in Kokua – we also found that 30 seconds is something of a magic value where the rest of the code is concerned. RLV: Alpha surfaces on other avatars’ rigged attachments will not be rendered if they are beyond a vision restriction. RLV: The RLV floaters (RLV Commands, Console, Status and Worn) have had an optimisation session aimed at reducing their load on the viewer whilst not displayed on screen. Thanks to Marine for some of the optimisation ideas now included in the code. This release of Kokua restores the OOC (Out Of Character) message functionality that was broken in 6.0.1.44374 following the RLV 2.9.24.1 merge. We have chosen to implement this in a way which not only supports the new behaviour of RLV 2.9.24.1 where OOC chat is routed to objects that are receiving redirected chat but can also support the traditional style of OOC chat where the viewer routes it directly to local chat itself. The switches to control this are located on Kokua/General in the Preferences window. 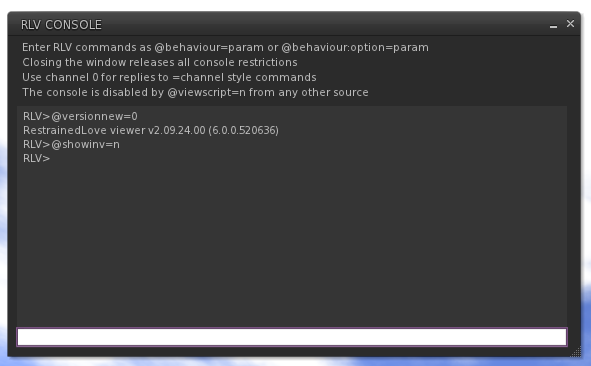 The first switch “Allow OOC chat using (( )) (Needs restart)” must be turned on to permit OOC chat. If this is turned off any OOC chat will appear as … in local chat even if no other chat restrictions are in effect. When OOC chat is allowed by the first switch the second switch called “Send OOC chat to redirected chat rather than local chat” comes into play. When turned on Kokua will follow the RLV 2.9.24.1 behaviour of routing OOC chat to redirected chat handlers and it will not appear in local chat. When the setting is off the original behaviour applies instead with the OOC chat appearing in local chat only and not being sent to redirected chat handlers. This behaviour is slightly different to RLV 2.9.24.1 itself. There OOC chat now always goes to redirected chat handlers and it cannot be disabled in the viewer – it’s up to the receiving objects/scripts what to do with it. With Kokua there is still a master switch in the viewer which can enable or disable OOC chat along with the secondary switch that controls its routing. Our apologies for the problem – this was a classic case of not thinking about a one line change deeply enough whilst merging RLV 2.9.24.1 with Kokua. Note that the fast-sun bug mentioned is not fully fixed in this version. This version also introduces a revised menu structure for the login and viewer main menus which is much closer to the current LL design. If you wish to use the new menu structure go to the Advanced Menu and turn off ‘Classic Kokua Menus’. The viewer must be restarted to apply the change.